The project settings editor lets you control project-wide configuration options. 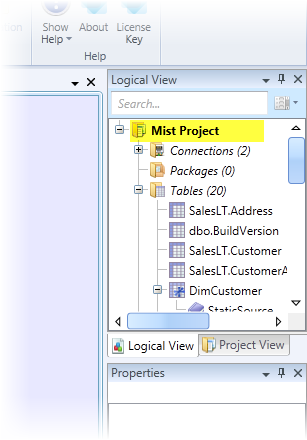 Open the project settings editor by double-clicking the project node in the Logical View. See the table below for an explanation of the settings on this page. Save the project after changing settings to commit the updates. Hadron Path The path to the 32-bit version of the Hadron compiler. 64-bit Hadron Path The path to the 64-bit version of the Hadron compiler. Extra Command Line Options Allows additional compiler settings to be passed to the Hadron compiler. See Hadron Compiler Command Line Options for details on the available options. Generate Response File Creates a response file, based on the current project settings, that can be used for command line builds. tf Path The path to the Team Foundation executable. This is only needed if you are using Team Foundation Server for source control. SQL Server Specifies the version of the SQL Server relational database to target. SSAS Specifies the version of SQL Server Analysis Services to target. SSIS Specifies the version of SQL Server Integration Services to target. Warn As Error Causes Hadron to treat warnings as errors during the compilation process, so that the build fails if any warnings are encountered. Output Path Specifies the path where the compiled assets from the project will be stored. This can be a fully qualified path, or a relative path from the project directory.